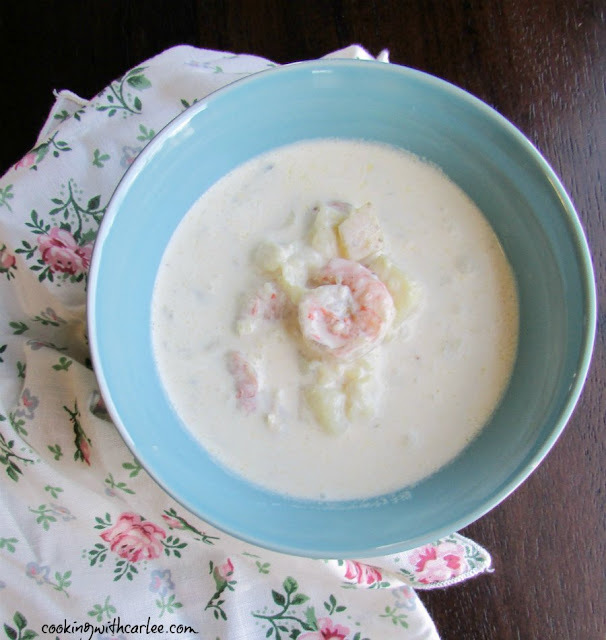 If you like a good seafood chowder, this one is sure to become your favorite. It is creamy, warming and comforting. Perfect for a fancy dinner or just because! 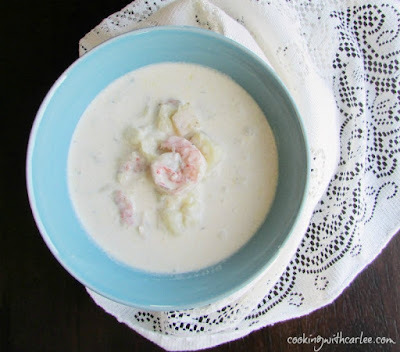 This chowder is like heaven in a bowl. It is creamy and delicious with big pieces of tender seafood. You don't have to hunt for the fish or shrimp, you know it's there. The flavors work so well together and it is a must make soup for sure! When my family got together for Christmas, we did what we tend to do while gathering for the holiday... talked about what we were going to make for New Year's Eve! I mean, isn't that what your family does when they get together too? We are always planning out what we are going to eat the next time. There was a stretch last fall where the menu was planned out at least 5 weeks in advance. Normally we don't take it quite that far, but for an event like New Year's Eve we have to get the ball rolling! My brother K.C. was pondering another crab fest. He hosted us for one a while back that was a hit and seafood seems to be our New Year's Eve thing. We have had seafood feasts a few years running with a slight break in tradition for our prime rib extravaganza last year! As we were discussing how much crab would be the right amount, Chloe chimed in with you should really make that seafood chowder. We all quickly agreed. You know it has to be good when it takes our mind off of crab legs! I volunteered to make dessert, roasted shrimp and a hot dip or two. And just like that New Year's Eve was planned. This soup is definitely special enough to make for a nice holiday or dinner guests. It is also easy enough to pull off on a weeknight if you feel like treating yourself to a warm bowl of seafood love. No matter the occasion, it is sure to be a new favorite! Cook bacon in a large soup pot until crisp. Remove bacon from pan and once cooled chop into small pieces. Add butter, bay leaves, thyme and onion to the pot and cook until the onions are soft. Add potatoes and fish stock. Bring to a boil for 12 minutes then reduce the heat and add the fish and shrimp. Simmer for 5 minutes. Remove from the heat and let sit for 10 minutes. Stir in cream and chopped bacon. Adjust salt and pepper to your taste. Bring on the belly warming chowder!!! It's so cold and I needed this soup week!!! Love it!! It is frigid, isn't it? And we got snow last night to boot! Soup is just what the doctor ordered! Pinned this to our Fish Friday Foodies board Carlee, thanks. My husband would love this soup! Great variety in your roundup and this is the season to try them all! Aren't there so many great ones in there? This is definitely one of my all time favorite soups, so I'm sure he'd love it! Thanks, Jas! Hi Carlee, winter is the perfect time for soup. 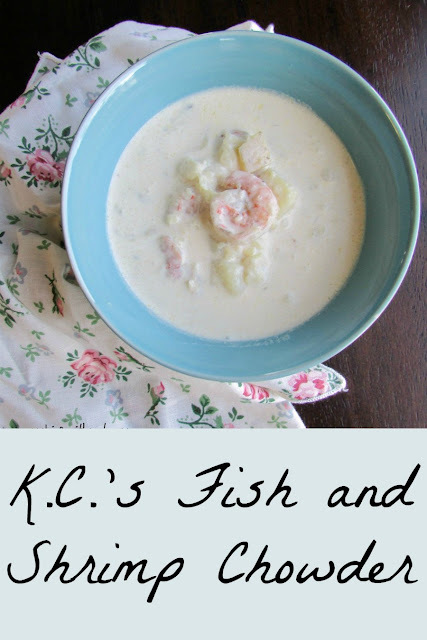 I love this soup recipe and thanks for sharing at C&C with J&J. Thank you Julie! Just the idea of soup warms me up a little ;-) This one is definitely one of my favorites too! Your soup sounds scrumptious. Our family is like yours, planning our meals! Love it! So glad you party with us at Merry Monday. Happy New Year! It definitely helps build the excitement (and make sure there is something everyone likes) when a big meal is coming if the whole group is involved in planning it! 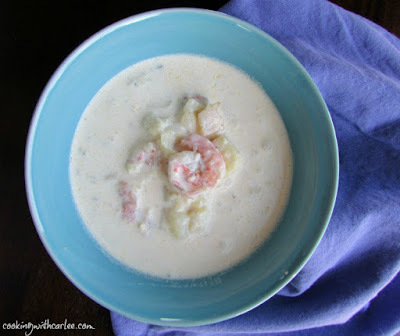 Mmmm, love a good seafood chowder! Thank you for sharing at Merry Monday! Me too and this is a definite favorite! Thank you! We are huge Seafood lovers. And this soup sounds perfect. Delicious and filling. Definitely going to add this to our menu rotation, it sounds so good. In fact my stomach is growling now! We are too and this is one of my absolute favorite ways to have it in the winter. It is special and approachable all at the same time. I have a whole family of people who don't eat seafood. I don't get it! I'd eat seafood everyday if I could! 😁 Looks delicious Carlee! What?!? No Seafood? The shame of it all!